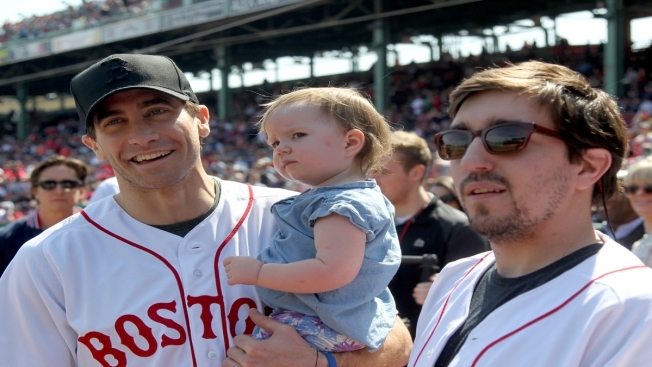 In this file photo, actor Jake Gyllenhaal smiles as he holds Nora Bauman, daughter of Boston Marathon bombing survivor Jeff Bauman, right, before filming part of a movie before a baseball game between the Boston Red Sox and the Toronto Blue Jays at Fenway Park, Monday, April 18, 2016, in Boston. Gyllenhaal is playing Bauman in a movie called "Stronger." The creators of an upcoming movie about a Boston Marathon bombing survivor are getting pushback for casting Jake Gyllenhaal to play double amputee Jeff Bauman — allegedly without considering actors with disabilities. The Ruderman Family Foundation — which supports the advancement of people with disabilities — condemned the makers of "Stronger" for choosing Gyllenhaal to portray Bauman, who lost his legs in the horrific 2013 terror attack. "The casting of Jake Gyllenhaal as the lead in the movie 'Stronger' is the perfect example on Hollywood's ongoing systemic discrimination against actors with disabilities," the foundation's president, Jay Ruderman, said in a statement. "By his own admission, Director David Gordon Green never even considered any other actors in a role in which Gyllenhaal plays a character who is a double amputee," he continued. "By not even giving actors who are amputees the chance to audition for the role awarded to Gyllenhaal, Green effectively denied actors with disabilities to even be considered for the role." Green recently told Entertainment Tonight that Gyllenhaal was the only actor who he spoke to about the role, explaining that he respected the 36-year-old star's ability to bring levity to a dramatic role. "It was important to be able to have some levity and from my first meeting with Jake, I knew he was going to be a playful actor that was able to break some rules of acting and go with me on a journey that was going to be both emotional and ultimately uplifting," Green told ET. The movie is based on a memoir — also called "Stronger" — co-written by Bauman in the aftermath of the bombing. Ruderman says he wishes actors with disabilities at least got the opportunity to try out for the role. Bauman is appreciative that Gyllenhaal will be portraying him on film. "I don't know another actor that could have conveyed that the early days are tough but there is a light at the end of the tunnel and things do get better," he said in a statement. "Many of my fellow survivors and amputee friends were extras and were amazed by the things he was doing on set." Reps for Gyllenhaal had no official comment. Reps for David Gordon Green did not immediately return a request for comment. The Ruderman Foundation recently criticized the makers of "Blind" for casting Alec Baldwin in the lead role rather than an actor with disabilities. "Stronger" premiered at the Toronto Film Festival last week. It's set to be released in the United States on Sept. 22. NBC's Teddy Grant contributed to this story.